Berrylife use modern technology to create unforgettable, intriguing installations. They focus primarily on creative and innovative content. Challenge: To emotively display a powerful story of the past from a Jewish girl in the Lodz Ghetto. Solution: Berrylife s.c installed 6 W505 Optoma ProScene models in the centre of the Galicia Jewish Museum. With WXGA resolution and 5200 lumens, this product is designed exclusively for demanding professional applications. It delivers exceptional bright crystal-clear images with ultimate reliability, while 24/7 operation ensures that this is a projector you can rely on. They were given the responsibility of displaying the re-creation of one of the most memorable events in history. “The Girl in the Diary” is an exploration into the life of innocent Jewish people during a time of Jewish destruction. Optoma were responsible for ensuring the story told in the Galicia Jewish Museum evoked powerful feelings on a large, bold and bright scale. 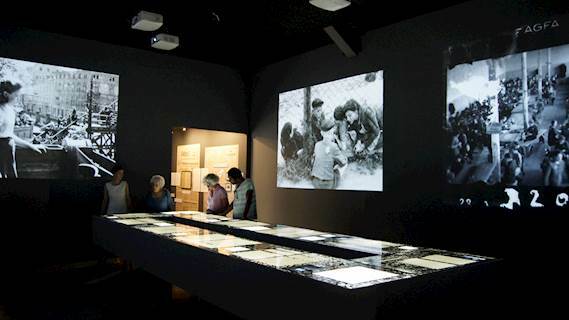 Berrylife selected 6 W505 ProAV models to best display a powerful, emotive piece of Jewish history. Optoma’s W505 has superb image quality with full lens shift and reliable colour performance, suitable for any content and environment. From accurate sRGB colours for vibrant, punchy life-like images at 5,200 lumens brightness, ideal for powerfully portraying the moving story.